Since we started building a learning platform at tutorials.ubuntu.com, we have published over 30 tutorials on a wide range of Ubuntu-related topics: for developers wanting to assess new technologies (such as installing Kubernetes or running Linux containers on Windows) and users (such as using the snap command and creating bootable Ubuntu USB sticks on Windows). After several iterations and some great feedback from readers, we are now confident the platform is able to handle external contributions. Since we are a mentoring Google Code-in organization this year, we have prepared a list of documentation tasks for all skills, ranging from testing existing tutorials and suggesting topics to writing a first tutorial under the guidance of the documentation team. These tasks (and tutorial requests in general) should give a good idea of the content we are trying to cover. Although there has been a guide to creating tutorials for the platform for some time, we have given this a major overhaul to cover additional details, as well as the bare mechanics of how the platform works. This guide is presented as an example tutorial itself, taking you from having a topic idea, through writing down the content in a structured way, to making the most of the tutorials engine and submitting your proposal for review by professional writers and engineers. Ubuntu tutorials are project focused, taking readers from A to B without getting too much into conceptual explanations. The aim is that they can work (as much as possible) in place of or addition to practical, peer-to-peer learning. Creating a tutorial is also a great and valuable experience for the author too – there is no better way to get on top of a subject than trying to explain it to someone else! 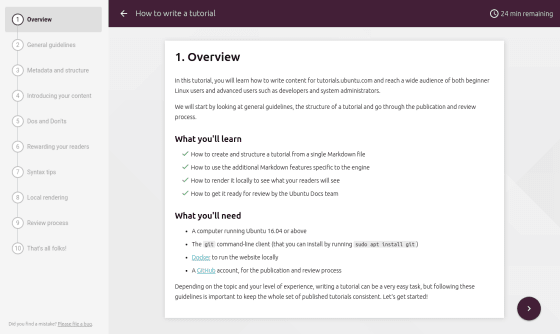 If you feel like you have some solid practical knowledge you can share, or you want to make a valuable contribution to an Ubuntu-related project, why not read our ‘How to write a tutorial’ tutorial and share your knowledge with a wider audience.